LONDON, England (CNN) -- A speed camera boss had a taste of his own medicine on Wednesday when he was banned from the road for driving at more than 100 mph (165 km/h) on a 70mph highway. Serco has installed about 5,000 traffic cameras in UK. Tom Riall, a chief executive of Serco, which supplies many of Britain's traffic enforcement cameras, was caught by a police patrol car in Newmarket, in the eastern English county of Suffolk. Riall was recorded driving at 102.92 mph in a Volvo car, Sudbury Magistrates Court heard. He was fined £300 ($450) and banned from driving for six months. The father of three made a statement outside the court in which he apologized for his actions. "I accept the decision of the court. I recognize that speeding is not acceptable and regret what I did," said Riall. "My speeding was excessive and I have made a full apology to the court." A Serco spokesman told CNN that Riall would not lose his job, and that he had pledged to provide his own driver to transport him for work. The court heard he had two previous motoring convictions, including a past speeding offense, from 2006 and 2007, the Press Association reported. 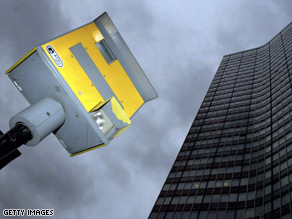 Since 1992 Serco has installed more than 5,000 traffic enforcement cameras around the United Kingdom. The company says on its Web site that its cameras had helped to save 100 lives a year "by deterring excessive speed and improving compliance with traffic signals." Riall, the chief executive of Serco's civil government division, has responsibility for installing and maintaining speed cameras, the court heard.